The West Africa Pre-release for the Mining in Africa Country Investment Guide (MACIG) 2019 is the official publication for Investing in Africa Mining Indaba produced by Global Business Reports. 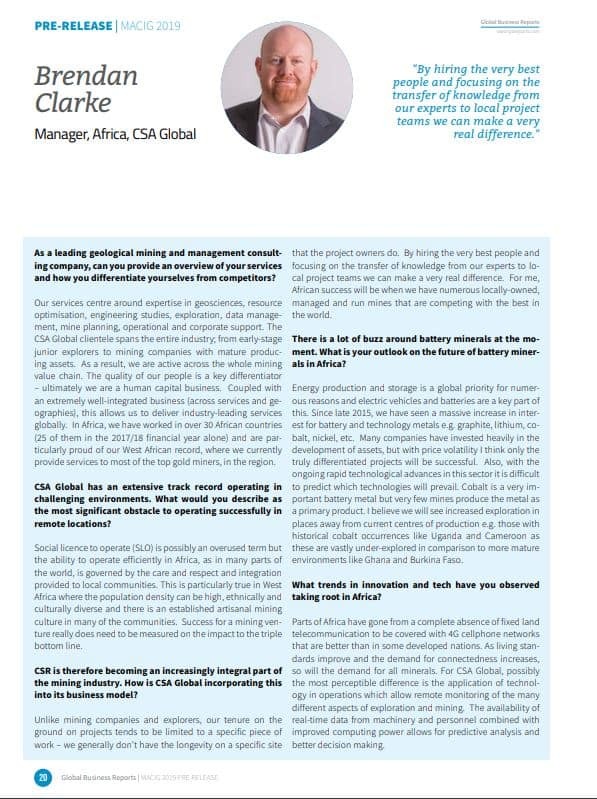 The pre-release edition featuring CSA Global Manager of Africa, Brendan Clarke highlights CSA Global and other key players operating across the sector in West Africa; from producers and juniors to consulting groups providing the region with services. The publication highlights West Africa’s rich mineral resource potential which presents a favorable investment proposition – significant gold discoveries have shone a spotlight on countries sharing the Birimian Greenstone Belts and, while mature mining countries like Ghana and Mali continue to lead the way in gold production, others are gaining ground as investors turn their attention to less-explored areas. While gold remains the focus for mining investment into West Africa, recognition of the region’s more diverse resource potential coupled with government efforts to mitigate risks associated with such heavy ties to just one commodity has led to a number of successful and promising projects in resources such as iron, lithium, copper and manganese. The final publication of MACIG 2019 will be launched at the African Mining Indaba in Capetown, February 2019.